In Windows Xp for formatting USB Drive only FAT or FAT32 Option is there if you wish to enable and use NTFS Format Option then continue reading this article. What are the Advantages Of NTFS? The advantage of NTFS file system is more security options and fast. Normally USB drive capacity is very small enough that NTFS is not recommended. But, nowadays USB drives are coming with larger capacity also. So we can format USB drive with NTFS to have more security options. 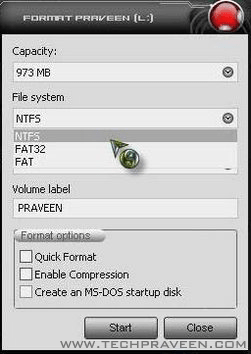 In Windows XP, only FAT and FAT32 file systems are available in format options, use the below steps to format in NTFS File System. Insert USB drive in your PC. Select Disk Drives and expand. Right Click on USB drive and select Properties. Go to policies tab and select Optimize for performance and press OK.
Now Right click on USB Drive and select Format Option. What are the difference between FAT and NTFS?